Earlier this year, a California man sued MillerCoors (which is half-owned by SABMiller, which is currently in the process of a massive global merger with Anheuser-Busch InBev) over its continued labeling of its Blue Moon brew as a “craft beer.” But yesterday, a federal court threw out the case against the mega-brewer. The original complaint [PDF] alleged that MillerCoors was deceiving customers into paying more for BlueMoon by labeling it a craft beer and by distancing the brand from the MillerCoors name. Citing the non-binding Brewers Association standard for craft beer — fewer than 6 million barrels produced annually; a craft brewer must be the majority stakeholder; the beer is made using only traditional or innovative brewing ingredients — the plaintiff contended that Blue Moon is just another beer made by a huge beer company. In fact, according to lawsuit, Blue Moon beer made for retail consumption is brewed at the same plant where MillerCoors makes decidedly non-craft brands Coors, Milwaukee’s Best, Miller High Life, Hamm’s, Icehouse and Olde English. The suit also called out MillerCoors for not placing its logo or info anywhere on the Blue Moon website, for listing Brew Moon Brewing Co. as the beer’s maker, and for using terms like “Artfully Crafted,” to describe the beer. The company also maintained that its trademark registrations for the Blue Moon brand and the fictitious Blue Moon Brewing Co. were sufficient to let consumers know that MillerCoors is the actual maker of this beer. Finally, MillerCoors argued that its use of the Blue Moon Brewing name instead its own was not deceptive but was within the California state “safe harbor” exception standard. Put plainly, if existing regulations allow the use of the fictitious name, then it does not violate the state’s Unfair Competition or False Advertising laws. The brewer pointed to state and federal labeling regulations that specify what information needs to be on beer packaging. California rules allow for the use of a fictitious name if it’s been properly registered. To MillerCoors, that means the use of the Blue Moon Brewing name is explicitly allowed by state regulations, preventing the plaintiff from bringing deceptive marketing claims against the company. The plaintiff countered that he wasn’t challenging MillerCoors’ legal right to use a fictitious name. He was alleging that the way in which it used the name was deceptive, pointing to precedent showing that just because someone’s actions are ostensibly legal doesn’t prevent someone from bringing a claim that they are unfair or fraudulent. This wasn’t enough to win over the judge, who noted that in order to bring such a claim, the plaintiff would need to show that MillerCoors was doing something illegal in addition to the legally protected behavior. The judge also took issue with the plaintiff’s claim that MillerCoors was doing everything it could to distance itself from the Blue Moon brand. 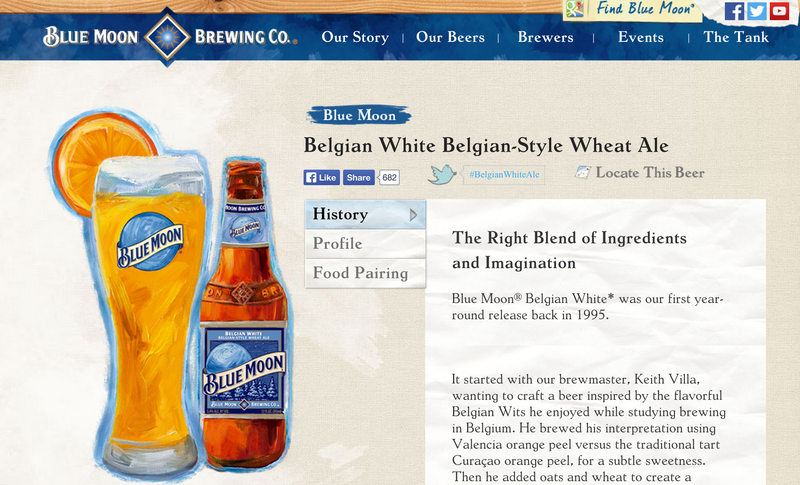 In dismissing the case, the court noted that while MillerCoors branding was not present on the Blue Moon website, the MillerCoors site made no effort to hide the company’s ownership of the brand. “[T]he Court cannot conclude that ‘it is probable that a significant portion of the general consuming public… acting reasonably under the circumstances’ could be misled by Blue Moon’s internet presence when MillerCoors ‘prominently’ displays Blue Moon on their own company website,” reads the order. Regarding the “Artfully Crafted” slogan, the judge found that this is not really a challengeable statement of fact — unlike a “Made in U.S.A.” or “All natural” claim — but a rather generic slogan. The plaintiff also failed to convince the court of his argument that the higher price charged for Blue Moon, or its placement on store shelves with other craft beers was deliberately misleading. But if the plaintiff does try again, he can’t rely MillerCoors’ use of the fictitious Blue Moon trade name or its use of the “Artfully Crafted” trademark.